Umdoni Park owes its existence to the foresight and generosity of Sir Frank Reynolds (1852 – 1930), Member of Parliament and successful sugar farmer. Through his political connections he became close friends with General Louis Botha, who on a visit to Lynton Hall apparently remarked that he would love to find some land close by and build a small ‘cottage’ for his wife. With this remark in the back of his mind, and no doubt inspired by Lord Lee’s 1917 donation of his country home, Chequers, for the use of future British Prime ministers, Sir Frank decided to do something similar and set about purchasing the land between Lynton and the sea, previously owned by the Pennington family. By May 1918, he had successfully negotiated to purchase the property and wasted no time in starting to plan the golf course. By September he had selected a site for the proposed ‘cottage’ for his friend General Botha, and shortly afterwards commissioned architect Paton from Durban to design the house. Construction started in June 1919 and the house was completed the following year. Sadly, General Botha died before he could be presented with the house, but his widow lived there fill she died in 1937, at which stage the house was made available to future South African Prime Ministers. 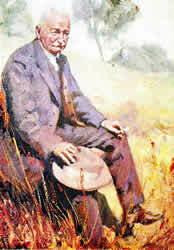 The Umdoni Park Trust was set up in 1920, following which the Park was presented as a ‘gift to the nation’. The Trust was required to ‘hold’ Botha House for the use of Annie Botha and at her death to the use of the Prime Minister. and his successors in office’, and to hold ‘the remainder of Umdoni Park Estate” to the use of the public. Although the Trust now became responsible for the administration of the Estate, Sir Frank continued to put enormous effort into the development of the property. The first 9 holes of the golf course were completed in 1921, with the second 9 holes being completed 9 years later. The club house was built in 1926/27. After Sir Frank’s death in 1930, the Reynolds family lived on at Lynton Hall and remained actively involved in Umdoni Park. His son. Lewis Frank Reynolds (1925 – 1940). his nephew Hugh Lewis Reynolds (1940 – 1945) and his daughter Molly Reynolds (1945 – 1966). All served as Trustees, while his grand daughter Jane Reynolds and great grandson Ronald Munro-Ferguson have maintained the close association between Lynton Hall Trust and Umdoni Park to the present day. Umdoni Park is situated on the south coast of Kwa-Zulu Natal, 80km from Durban. It covers an area of 210 hectares (508 acres). The land rises from the rocky Indian Ocean coastline in the east, through gentle rolling hills covered by a highly rated 18 hole golf course, before giving way to dense coastal forest, rich in animal and birdlife and accessed via an extensive network of walking trails. The park is administered by the Umdoni Park Trust, which was set up in 1920 by the founder, Sir Frank Reynolds. The Trust maintains the golf course and all the buildings on the property, some of which date back to 1920. In addition they are responsible for the preservation of the wilderness area which involves an apparently never-ending battle against invasive alien vegetation. While accepting that conservation of the environment is central to our role, the Trust is keen to play an educational role as well and to this end employs an environmental officer who is available to take guided walks around the park and to give talks and demonstrations to schoolchildren and adult parties. Apart from day visitors, Umdoni Park also offers bed and breakfast accommodation in 6 luxury double rooms and 1 family cottage at Botha House, positioned next to the golf course on a headland above the wave-battered Umdoni Point.